It's probably fair to say you've got a better range of choice than ever before when it comes to choosing a new laptop – today's portable computers are faster, lighter, and more stylish than ever before, so chances are you'll be able to find something that catches your eye. Near the top of your shortlist should be the Dell XPS 13 and the Dell XPS 15, both refreshed for 2018. 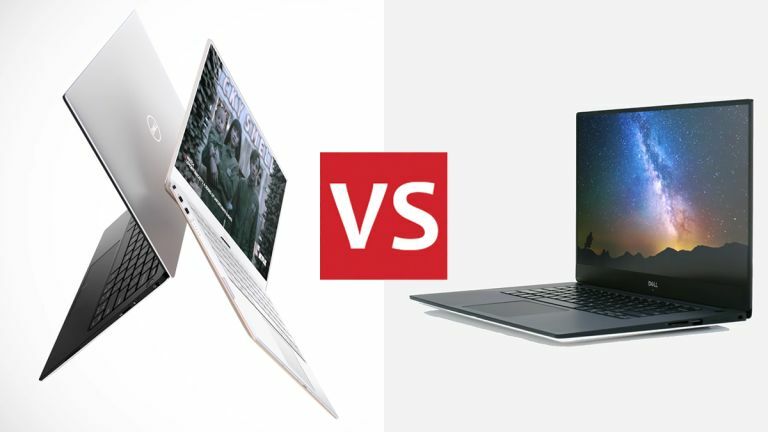 Here we're going to pick apart the details of both laptops, explaining how they stack up against each other, and helping you decide which one might be right for you. With Dell releasing new computers and new configurations of these computers so often, keeping track can be tricky, especially when the model names stay the same. Here we're talking about the 2018 laptop editions of the XPS 13 and the XPS 15, so not the 2-in-1s. These two laptops are similar in name, and very similar in style too. Let's get the obvious point out of the way: the XPS 13 has a 13.3-inch display, and the XPS 15 brings with it a 15.6-inch display. In both cases you can opt for 1920 x 1080 or 3840 x 2160 (4K) resolutions, so the key difference is the size (and associated bulkiness). As always with laptops, it's a question of whether you want to see your movies and your documents at a bigger size, or would rather have something that's easier to lug around. Both the XPS 13 and the XPS 15 offer touchscreens as an optional extra. Bezels have been all but banished from the sides of the screen with both these laptops, and another similarity is the striking aluminium and carbon fibre chassis – it's a class design from any angle you want to take. One variation is that the smaller model comes in rose gold and white as well as black and grey, whereas you only get the latter option on the bigger laptop. You'll find the XPS 13 weighs in at 1.21 kg (2.67 lbs) and up, whereas the XPS 15 starts at 1.8 kg (4 lbs), depending on whether you get a touchscreen and what type of drive you opt for. That's not a huge difference, but it's noticeable, so factor that into your decision if you're thinking about picking up one of these laptops. Dell being Dell, a whole host of configuration options are available for the XPS 13 and the XPS 15, and they change pretty regularly too. Your best option for finding out what combination of specs are currently on offer is to visit the Dell website directly, but we'll give you some edited highlights that are correct at the time of writing. What's certain is that these are laptops aimed at the premium end of the market, as proved by the 8th-generation Intel quad-core processors inside – your pick of i5 or i7 chips. The Dell XPS 13 sticks to 8GB of RAM, 256GB of SSD storage, and integrated Intel UHD Graphics, at least in the options currently available in the UK. That's plenty of power for most people, but the Dell XPS 15 ups the ante with a maximum of 32GB of RAM, 1TB of SSD storage, and Nvidia GeForce GTX 1050Ti graphics available alongside some lower-spec configurations. If you want a computer that's really going to scream along, the XPS 15 makes that possible. Of course the more power you go for, the more you're going to have to pay, so make your choice accordingly. With the 8th-gen Coffee Lake CPUs from Intel at the heart of everything, whichever model you choose you can be sure of excellent portable power with a minimum of power draw. The screens, the designs and the key specs of these two laptops are really the standout features, but there's a bit more we can talk about. You can get a bigger 6-cell battery on the 15.6-inch model, for example, compared with the 4-cell on the 13.3-inch computer – though the bigger machine has a bigger screen to run, of course. Ports and connectivity options are broadly the same across both the XPS 13 and the XPS 15, with both featuring a headset jack, a card reader, and a combination of USB and Thunderbolt ports. The larger model does have a full HDMI port, while the smaller one makes do with USB-C/DisplayPort. Both laptops have full-sized keyboards but no number pad, and both feature the webcam in the usual spot for the XPS line now: right under the screen (so you need to make sure it's tilted to get your face in shot). Speaking of webcams, both the XPS 13 and XPS 15 work with Windows Hello, so you can unlock your laptop with your face. Both have the option of a fingerprint sensor embedded in the power button too, giving you another way of unlocking these devices with biometrics. The extra size of the Dell XPS 15 gives you a few more options in terms of ports, but otherwise it's about honours even when it comes to these two laptops and the extra features you get with them. Finally, both laptops carry the new Dell Cinema display standard, for a greater colour range and balance. Starting prices for both these laptops are a little under the £1,300 level at the time of writing (or a little under $1,000 in the US), though head to the Dell website or check the widgets on this page for the latest pricing. The differences come at the higher end – you can spend a lot more on a Dell XPS 13 than you can on a Dell XPS 15. You can't really go wrong with either laptop – these are two of our favourites of the moment – but pick the Dell XPS 13 if you're looking for something more compact and easier to carry around. The integrated graphics make it less suitable for demanding tasks like gaming or video editing, though it should cope with most challenges perfectly well. The Dell XPS 15 gives you the option of a bigger, more powerful machine, with extras like a full HDMI port for hooking it straight up to a larger screen. If you've got the money to afford it, you can trick out the XPS 15 to be one of the most powerful consumer laptops on the market at the moment. In both cases you can configure the laptop to a certain extent on the Dell website, so you don't have to pay for a level of performance you don't need. If you are considering a purchase, keep an eye on the prices, which are likely to fluctuate as special deals on the hardware come and go.